Decades ago, long before concerns about energy consumption, a fellow teacher passed on a tip: when the winds are high pupils’ behaviour gets over-excitable, so put the lights on in the corridor. With winds very high today the sight of the huge pylons and switching gear just before Hawkesbury Junction (near Coventry) was strangely comforting. Usually the site is viewed as a monstrosity, today it is a reminder of the importance of power and energy. No decision to move this morning was made until after a trip to Tesco*. Our mooring under trees emphasised the wind noise in the foliage. Oncoming boaters talked of the canal course being fairly sheltered so off we set. For the first few miles, despite the noise of the wind, progress was reasonably smooth. Through Rugby we cruised and on through Newbold and its cleverly lit tunnel. The cover of All Oaks Wood provided respite from the wind. Then we came behind a nervously slow hire boat whose crew frequently had to pole the boat out of shallow water or trees; fatigue and unhappiness was writ across the drawn features of the helmsman as he beckoned us past. Brookfield Farm appeared on the right; no sign, however, of David, Ruth or Pip Archer. Just after passing under the M6 (“I’d rather be here than there,” announced the Captain) ‘a pair’ was spotted in the distance, a motor boat towing a butty. For two long hours we followed their slow progress in high winds – until, at last, (by then after crossing under the M69) the boats were pulled in so as to give the dogs a break. 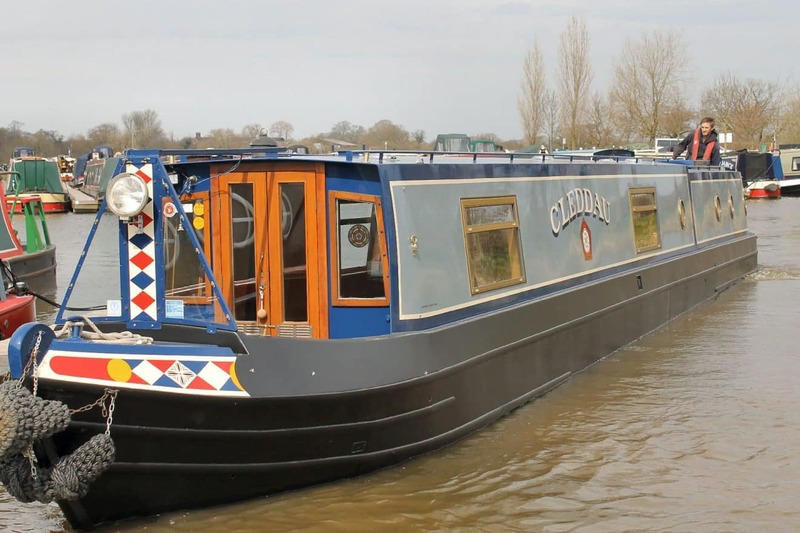 We approached Hawkesbury Junction, with its roar of traffic and endless electrical gear, made the first right hand turn beautifully; the second turn however was, well, over-fast and not at all pretty! These are the waters of the Coventry Canal, and its mainly northerly course has meant the wind was behind the boat rather than across the bow. The old Pearson Guide (1993) says: Why is the Coventry Canal like the Nile? Answer: because it passes the pyramids. The route passes Bedworth and Nuneaton, and still in some places the old quarry tips can be seen. The curious display of mannequins at Charity Dock, schools, playing fields, back garden fences, a few houses on one stretch displaying proud gardens to the canal, glimpses of factories – and on the left hand bank well-worked allotments, the runner bean frames trembling in the breeze. But from the canal there is no view of town centres or civic buildings. Along this way a solitary old telephone pole stood, a forgotten relic, perhaps. 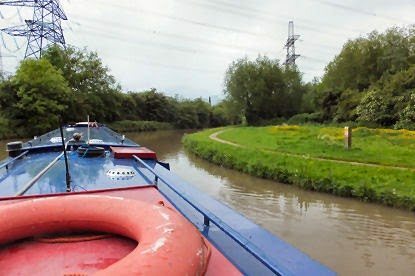 After about seven hours of blustery boating a day was called, a little short of the intended destination, but close enough to get into Atherstone Locks tomorrow, which, to conserve water, will be padlocked at midday. A final reflection on the unbeautiful pylons: the Californian Clan has reported on “the power outage” suffered last week; 7 million people, businesses and services were blacked out by a maintenance error in Arizona which affected other under-lying problems. Cal Guy had an extra day off school, Cal Son made his way home minus the help of any traffic lights, Cal Clan BBQ’d with the neighbours (or US: neighbors) and wished their ceiling fans and air-conditioning would run again. Their power cut at home lasted ten long, hot hours. So perhaps, despite their unlovely appearance, the pylons et al deserve some love…? *Does anyone else have an issue with self checkouts? The Captain wishes to propose a motion: This house maintains that any self checkout machine that requires staff assistance five or more times should provide a discounted bill to the customer as compensation for lost time….